© thinkstock. Veel eilanden voor de kust van Estland zijn niet groter dan een rots. In Estland weten ze niet beter dan dat hun land bestaat uit 1521 eilanden. Maar die informatie is achterhaald: uit nieuw onderzoek blijkt dat het land veel meer eilanden heeft. In totaal behoren 2222 eilanden tot het Estse grondgebied. En zelfs 2355 als je de eilanden in meren meerekent. Het land wordt daarmee direct honderd vierkante kilometer groter. Onderzoekers van de Estse Grondraad analyseerde luchtfoto's op basis van laserscanning en ontdekten dat al die eilanden binnen de territoriale wateren van Estland liggen. De landkaarten die voorheen werden gebruikt stamden nog uit het Sovjet-tijdperk. 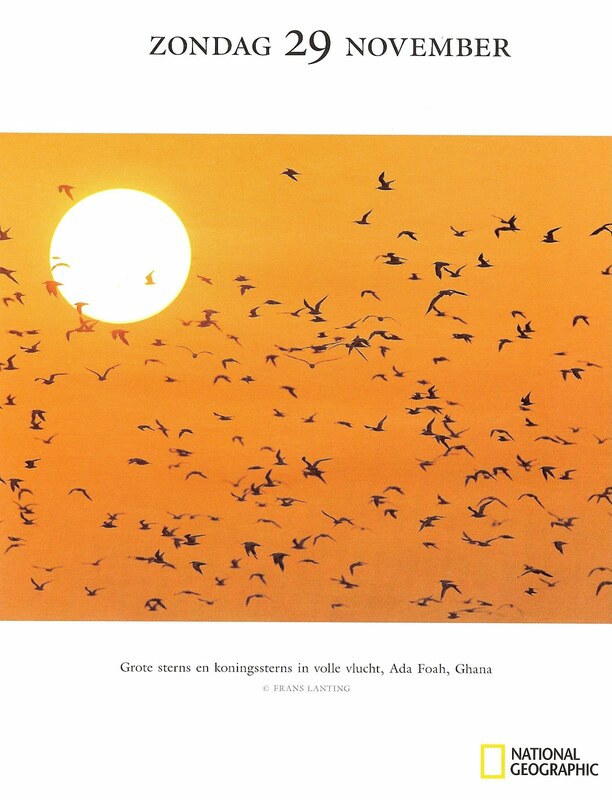 Het grootste gedeelte van het Estse grondgebied behoort tot het Europese continent. De meeste eilanden die bij Estland horen zijn niet meer dan stipjes in zee: slechts 318 zijn er groter dan één hectare. Nieuwe technieken stelden de onderzoekers in staat veel nauwkeuriger te bepalen hoeveel eilanden er tot de Estse archipel behoren. "Daarbij is de grond in het noorden van het land in de loop der jaren wat omhoog gekomen", vertelde voorzitter van de Estse Landraad, Agnes Jürjens aan de krant Postimees. "Bovendien hebben we ook te maken met een stijgende zeespiegel en andere weersomstandigheden die de kustlijn kunnen veranderen." De volgende 'eiland-meting' staat gepland voor 2020 en Jürjens verwacht dat het aantal dan weer zal worden bijgesteld, zij het niet meer met zo'n significant aantal. AANRADER / GOED DOEL: Prachtige Actie in o.a. 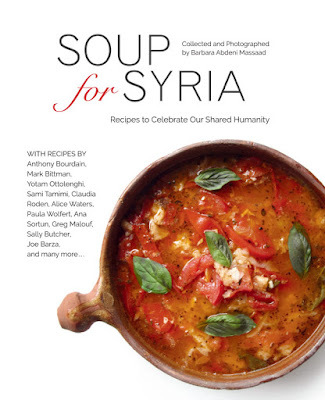 American Book Centres & en in Vele Landen: 'Soup for Syria' - Doe Mee! De cover van het kookboek, je kunt het boek inzien, en meer over de actie --- Hier --- vinden. It was a cold winter night. Barbara Abdeni Massaad sat shivering in her apartment in Beirut, Lebanon. She turned on her heater to warm up but still had no relief from the frigid weather. "That night, I couldn't sleep thinking about refugee families in the Bekaa sleeping in their tents," she said. "How were they able to beat the winter cold?" Massaad became so concerned about the conditions in refugee camps, she couldn't sleep a wink. "I couldn't go on with my life and ignore theirs," she said. That Sunday during Mass, she chatted with a friend from the United Nations. That friend told her about a camp in Zahle, Lebanon. "I went to visit the refugee camp, not really knowing what to expect," said Massaad. "I felt the urgency from the moment I set foot in the refugee camp and witnessed their suffering with my own eyes." "My visit brought me closer to the problem and inspired me to find a way to ease someone's pain," she said. As a cookbook writer, photographer and president of Slow Food Beirut, it came natural to Massaad to use food to as a way to make an impact. 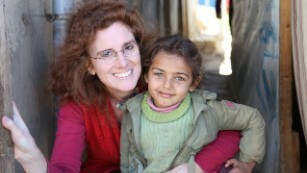 She and a friend banded together and began making homemade soup for the Hamra refugees. "I started taking photos of the refugees and talking to them about food," she said. 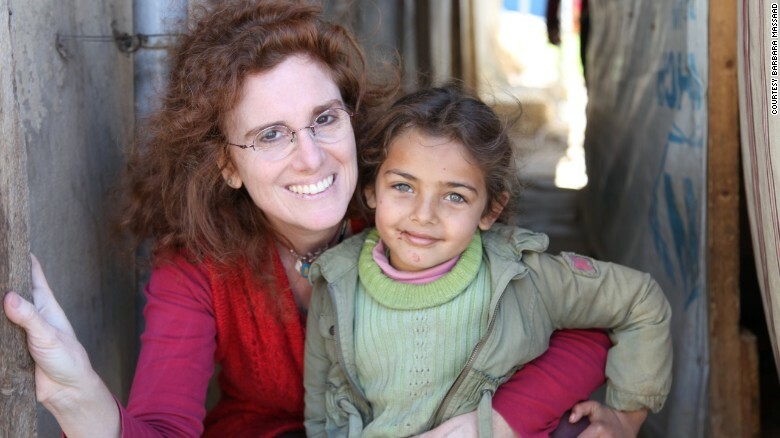 After a few weeks, she decided to do a humanitarian cookbook as a way to help Syrian refugees. It was then that "Soup for Syria: Recipes to Celebrate our Shared Humanity" was born. Massaad began to reach out to her foodie community, which included fellow writers and acclaimed chefs she'd worked with in the past. Most of them were glad to join in her efforts. She held soup workshops and had volunteers come to her home to cook hundreds of soups. She tested and photographed them. In the fall of 2014, Massaad met with her U.S. publisher, Michel Moushabeck of Interlink Books, who immediately decided this cookbook needed to be taken to a global level. "The Interlink team did not treat the book as only a book project," said Massaad, "but as an initiative that could help create an international movement to help Syrian refugees." A total of 80 contributions in all were made to the book, including from Joe Barza, Sally Butcher and Yotam Ottolenghi. CNN's own Anthony Bourdain also contributed. In a contributor's statement, he said that soup "is elemental, and it always makes sense, even when the world around us fails to." Although many of those featured in the recipes are celebrity chefs, Massaad made sure to include others. "I also wanted to include a selection of recipes from friends, relatives, Facebook pals who helped a great deal in the project," she said. 100% of U.S. sales of "Soup for Syria" will go to the United Nations High Commissioner for Refugees for food relief for refugees. "When I write books, I always focus on the people behind the food, and this time it so happens that those people are refugees," said Massaad. "I would always tell the refugees, 'Had I been a barber, I would have cut your hair for free. I am not a barber, but a photographer and food writer, so I will take photos and write about food to help your cause and send a message to the world,' " she added. "Each kind gesture towards another in need is a step forward for humanity. Use what you know best to help others." Comfort food is often the food that reminds us of home, of the country where we grew up. Soup is often the most comforting, soothing and healing of all dishes, so by extension it’s the dish that connects us most with home. All proceeds from the book go to the UN Refugee Agency, to help fund lifesaving relief efforts for the refugees. This is going to be only a drop in the ocean, I know, but do buy a copy, if you can, then make some soup and think of home. This recipe isn’t in the book, but it does remind me of the flavours of home. Serves six. Heat the oven to 200C/390F/gas mark 6. Put the beetroot in a high-sided, 20cm x 30cm baking tray, so they fit snugly. Cut off and discard the top quarter of the garlic head, then put the garlic cut side up in one corner of the tray. Drizzle the garlic with a teaspoon of oil and sprinkle with a pinch of salt. 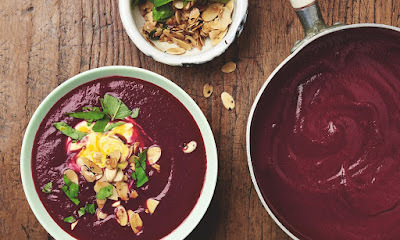 Cover the tray tightly with two layers of foil, then roast for an hour, until the beetroot are soft when pierced with a knife and the garlic is caramelised. Set aside for about 10 minutes, until the beetroot are cool enough to handle, then peel and discard the skin, and chop the beets into 2cm dice. Squeeze the garlic cloves out of their skins and into a small bowl. Mix the saffron (and its soaking water) with the yoghurt, lemon juice and a quarter-teaspoon of salt, and set aside. Put a medium frying pan on a medium heat with a tablespoon of oil. Once hot, add the almonds and chilli, fry for a minute or two, stirring often, until they start to turn golden, then tip into a bowl. Put two tablespoons of oil in a large saucepan on medium-high heat. Fry the onion in the hot oil for eight to nine minutes, stirring a few times, until soft and caramelised. Add the ginger, cinnamon, orange skin and three-quarters of a teaspoon of salt, fry for a minute longer, then add the beetroot, roast garlic puree, orange juice and stock,. Leave to simmer for 10 minutes, then take off the heat, remove and discard the orange skin, and blitz smooth with a stick blender. Divide the soup between six bowls, spoon a good dollop of yoghurt on each, sprinkle the almonds and basil on top, and serve.